19 Sunday February 7th 1875. I wrote Charlie a long letter before church time this morning. We all went to church but Jennie. Ett and Tom came out home just before noon. After dinner I made out a schedule and then visited and helped with the singing the rest of the afternoon. In the evening we took Tom and Ett down home and from there went to church. Had lunch after we came home and by the time that was through it was bed-time. 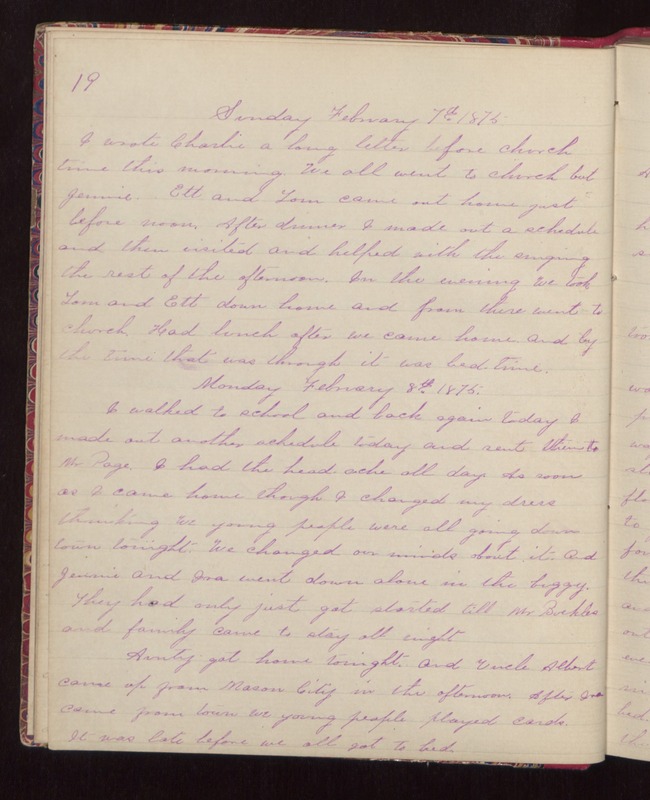 Monday February 8th 1875. I walked to school and back again today. I made out another schedule today and sent them to Mr Page. I had the head-ache all day. As soon as I came home though I changed my dress thinking we young people were all going down town tonight. We changed our minds about it. And Jennie and Ira went down alone in the buggy. They had only just got started till Mr Buckles and family came to stay all night Aunty got home tonight, and Uncle Albert came up from Mason City in the afternoon. After Ira came from town we young people played cards. It was late before we all got to bed.